VIENNA, V.A. (April 10, 2018) — SitScape, Inc., the innovator in Collaborative User-Defined-Operating-Picture (UDOP) and Digital Enterprise Enablement Platform (DEEP) software, and AECOM, a premier, fully integrated global infrastructure firm, today announced they have signed a five-year strategic partnership agreement. This strategic partnership will include the rollout of SitScape’s software in AECOM’s Management Services group. It not only benefits AECOM’s internal operations, it also optimizes the mission-critical operations of AECOM’s global customers by applying SitScape’s award-winning, no-coding DEEP software with integrated data analytics, machine learning, visualization, process automation and collaboration capabilities. SitScape’s software empowers senior leaders, mission users, operators and analysts at enterprise or program, project levels to gain greater utility and integration over their current vast disparate information sources and siloed applications. By simply using a web browser, and with no coding needed, they can contextually visualize, analyze, communicate, share and collaborate in real time across globally distributed users and organizations with optimized human machine teaming. Clients benefit from the underlying machine learning, and automated data or process flows enabled by SitScape’s patented technology. This can be done via a personal computer or mobile device for rapid shared situational understanding, actionable operational intelligence and discrete performance optimization. 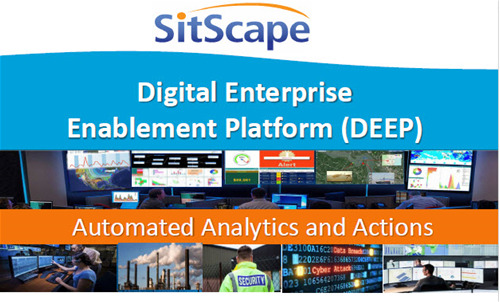 SitScape Inc., the recognized leader of Digital Enterprise Enablement Platform (DEEP) software solutions for Intelligent Digital Operations, is trusted by various Fortune 500 organizations and the federal government for their digital transformation, real-time collaboration, knowledge sharing, agile data correlation, continuous monitoring, machine learning, analytical visualization and flexible Straight-Through-Processing (STP) data flow and process automation. Our self-service, easy-to-use User Defined Operating Pictures (UDOP) graphical user interface, combined with the underlying STP engine, can support critical decision making at real-time with actionable digital intelligence, smart human-machine teaming, dynamic collaboration and automated data and processing flows at the enterprise scale. To learn more about SitScape and its software, please visit www.sitscape.com. CACI International Inc (NYSE: CACI) announced that it has been awarded a $48 million prime contract to provide information technology support services for the Army Architecture, Operations, Networks, and Space (AONS) Directorate of the U.S. Army Chief Information Officer (CIO)/G-6 that will maximize mission performance via innovation, transparency, and greater efficiencies. Team CACI includes CACI as the prime, and SitScape was selected and included as the leading enterprise software platform as part of the AONS proposal and award. The U.S. Army CIO/G-6 leads Army network modernization to deliver timely, trusted, and shared information for the Army and its mission partners. Under the AONS contract, Team CACI will provide technical services supporting the CIO/G-6 in planning, program, budget, and analytical services to aid in resourcing critical Army command, control, communications, computers (C4) and IT needs. Team CACI will also provide recommendations for how the CIO/G-6 can synchronize technology and business management to enable better execution, risk control, and efficiencies for the Army. CACI provides information solutions and services in support of national security missions and government transformation for Intelligence, Defense, and Federal Civilian customers. CACI is a member of the Fortune 1000 Largest Companies, the Russell 2000 Index, and the S&P SmallCap600 Index. CACI’s sustained commitment to ethics and integrity defines its corporate culture and drives its success. With approximately 20,000 employees worldwide, CACI provides dynamic career opportunities for military veterans and industry professionals to support the nation’s most critical missions. SitScape Inc., the recognized leader of software solutions for Intelligent Digital Operations, is trusted by the government and various Fortune 500 organizations for real-time collaboration, agile data correlation, machine learning, continuous monitoring, analytical visualizations and flexible straight-through-processing (STP) automation. Our solutions support critical decision making at real-time with the self-service, easy-to-use, highly collaborative User Defined Operating Pictures (UDOP) graphical user interface, and the underlying STP and Machine Learning engines with unmatched data correlation, analytics, monitoring, alerting and process automation capability for the next-generation digital operations. o Data, Web sites, applications, video, images, documents etc.